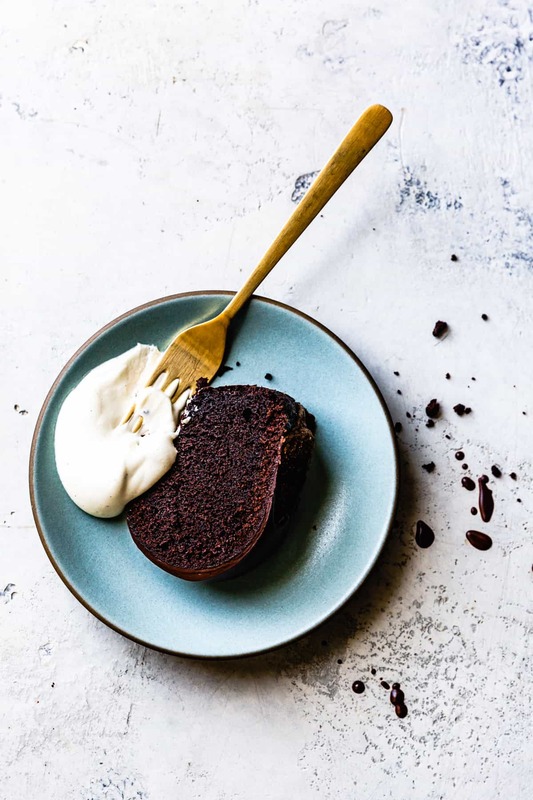 This gluten free chocolate bundt cake gets its fudgy interior and fine crumb from nutrient-rich teff flour plus loads of butter and crème fraîche, all crowned with dark chocolate ganache. Thanks to Vermont Creamery for sponsoring this post! I’ve always felt a bit intimidated by bundt cakes. They’re just so BIG, and they bring with them so many opportunities for things to go wrong. They can come out dry, burn on the outside while staying raw inside, or stick, cement-like, to the interior of the pan. 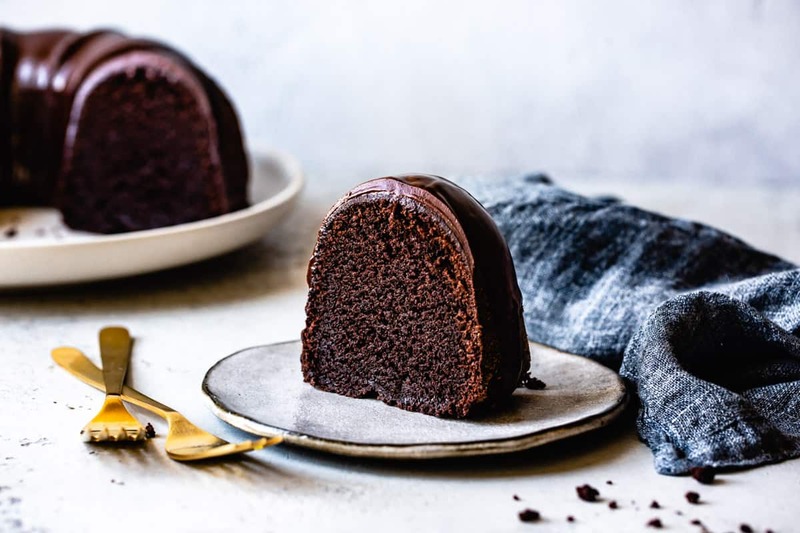 I’ve baked and styled my fair share of bundt cakes for NYT over the years (in fact the very first recipe that Sarah and I styled for them was this tunnel-of-fudge cake baked in a bundt pan!) But nine years into this site, I thought it was finally time to embrace the bundt. 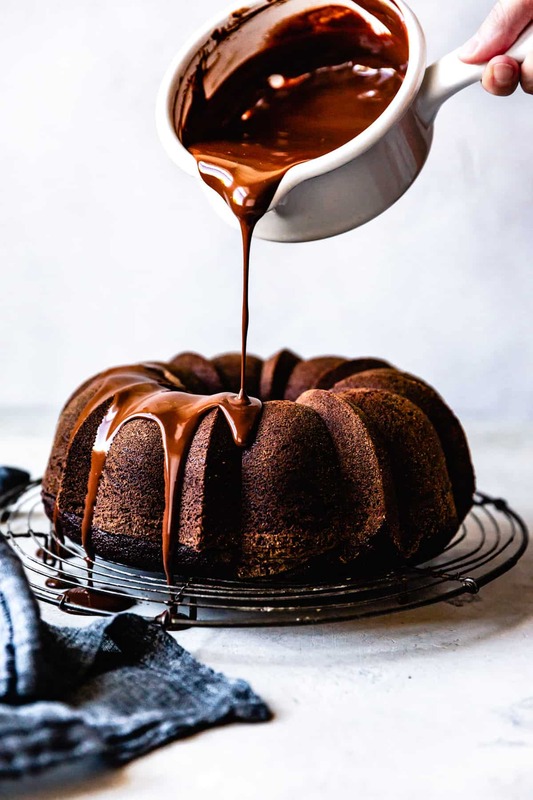 And what better recipe to start with than a super moist, fudgy, ganache-laden gluten free chocolate bundt cake? This beauty is infused with the flavors of molasses-rich brown sugar, tangy crème fraîche, European-style butter, and earthy teff flour. Loads of dutch-process cocoa powder give the cake a deep, dark chocolate taste. The cake is crowned with a layer of silky dark chocolate ganache made extra luscious from a dose of whiskey and more crème fraîche. 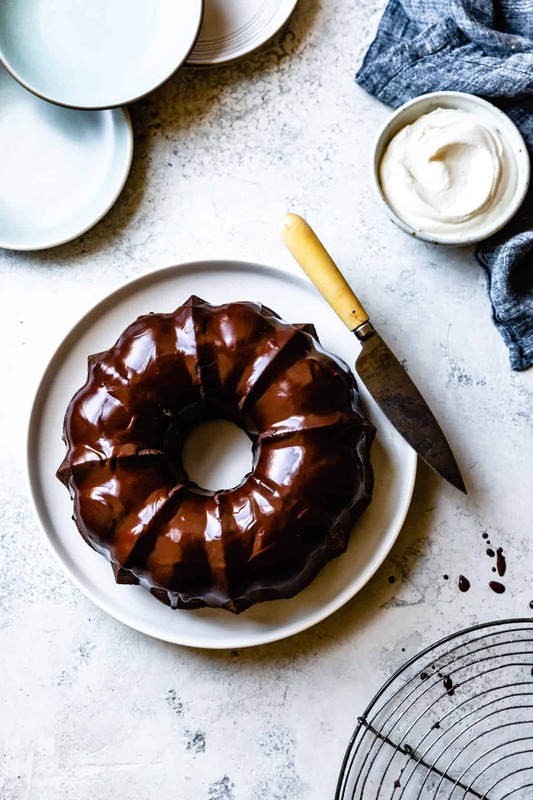 Chocolate sour cream bundt cakes are a classic, but this version trades in ultra-decadent crème fraîche from Vermont Creamery. 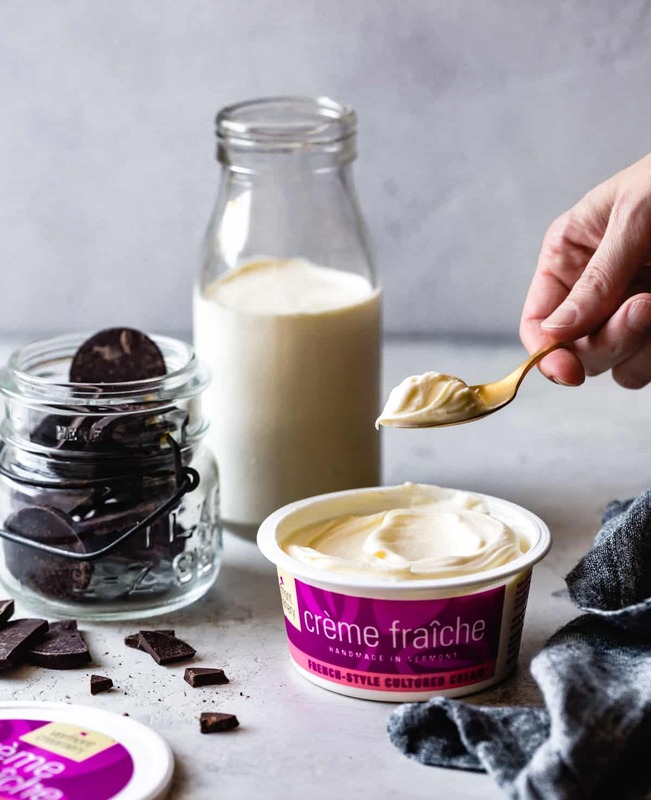 Crème fraîche has a higher fat content than sour cream (30% vs. 20% respectively) and it doesn’t contain any thickeners like sour cream sometimes does. It originated in France so, like all things French, it’s extra delicious and fancy with a slightly tart, nutty flavor. 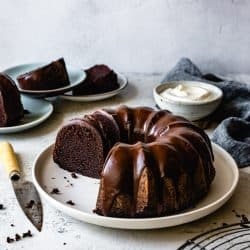 This gluten free chocolate bundt cake also gets an added dose of richness from Vermont Creamery’s cultured European-style butter, which clocks in at 86% butterfat. It has a super creamy texture with a hint of tang from the culturing process. I’ve written about my love for Vermont Creamery and their delicious products before, and I’m thrilled to get to feature them again here. A trio of flours – teff, sweet rice, and tapioca – create a fine, well-structured crumb. Teff is a naturally gluten free grain that hails from Ethiopia and I’m completely in love with its malty flavor. Its high protein content bakes into sturdy cookies and cakes, and it’s good for you too! Sweet rice flour is more finely ground and sticky than regular rice flour. It gives this cake a soft chew and prevents it from being crumbly. Tapioca starch or flour (same thing!) 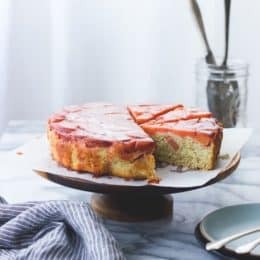 is ultra sticky and helps cakes bake up light and fluffy because it makes the batter extensible or stretchy, allowing it to capture steam in the form of tiny air pockets that lighten the crumb. This gluten free chocolate cake batter takes about 10 minutes to whisk together in one bowl. The ratios are adapted from Sarah’s favorite gluten free chocolate cake that I’ve riffed on with teff flour, brown sugar, and cultured dairy. I shared a chocolate peanut butter version earlier this year made with roasted peanut oil and buttermilk. To turn it into a sturdier bundt cake recipe, I trade in melted butter for the oil and crème fraîche for the buttermilk. The result is an extra dense and fudgy cake with a fine crumb, somewhere between a chewy brownie and a fluffy classic chocolate cake. Because we’re not using gluten, we can mix the dickens out of this batter and it won’t turn tough. 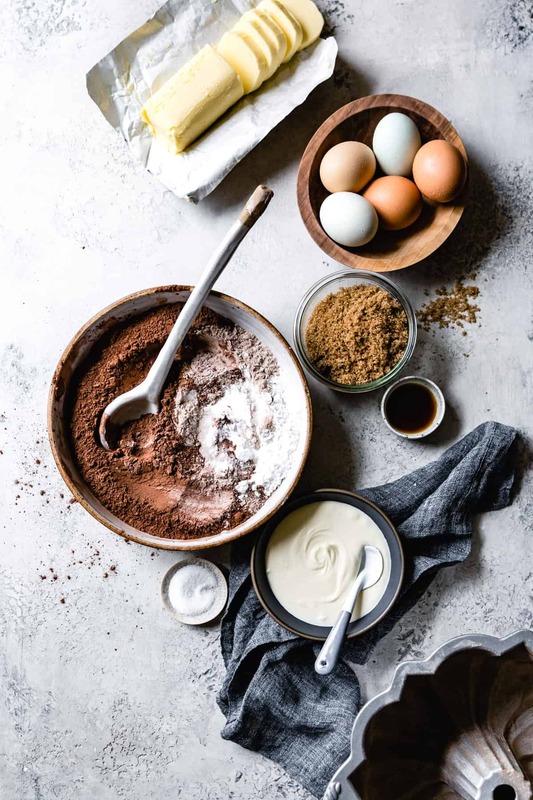 Just throw the flours in a bowl with cocoa powder and leavening, add the butter, eggs, crème fraîche, and hot water, and whisk. But if gluten isn’t an issue for you, try this festive version from Foolproof Living. 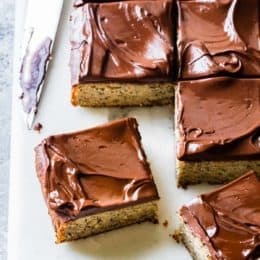 I top this cake with a pour of creamy dark chocolate ganache, which not only adds another hit of chocolate, it also locks in moisture in the cake itself. 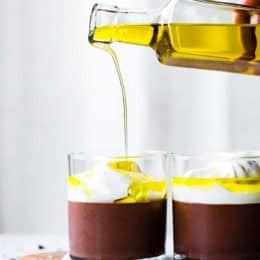 The dark chocolate ganache topping gets a flavor boost from crème fraîche, a splash of whisky, vanilla, and a pinch of salt. Be sure to use a chocolate you love the taste of here, and for best results, use a bittersweet chocolate with a cacao mass of 65-70% so that it sets properly. 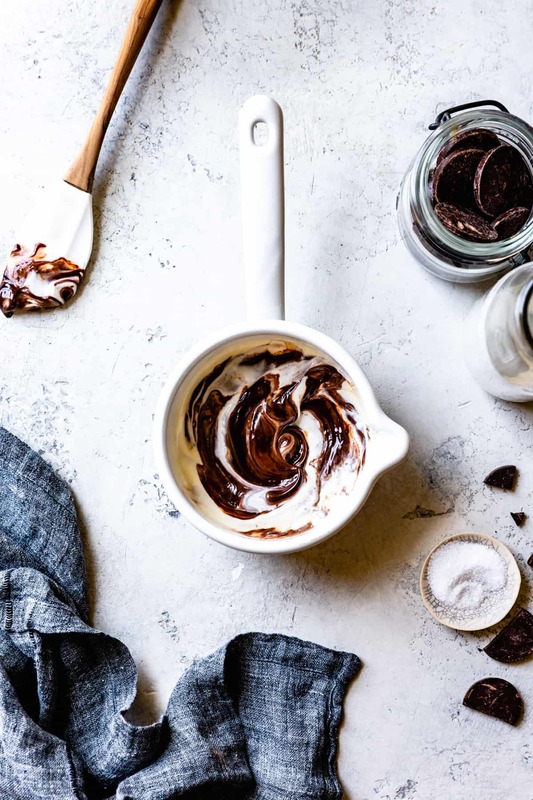 Opt for a baking chocolate or a bar of chocolate rather than chips, which contain ingredients to prevent them from melting, which is not what we want here. The biggest perk about being blessed with a big bundt? There’s more to share! 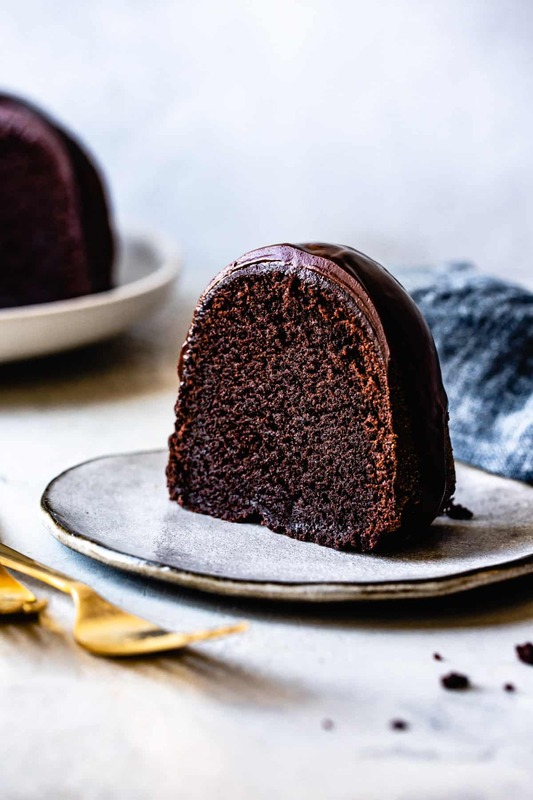 This gluten free chocolate bundt cake makes an impressive addition to holiday festivities, and there’s more than enough to go around. The cake is rich so small slices are in order. They’re equally lovely nibbled with a cup of tea or coffee in the afternoon as they are plated for an after dinner treat. I’m one of those people who likes a bite of something sweet after every meal, and it’s a bonus if that sweet something is of the chocolate variety. I’m in heaven when there’s double chocolate bundt cake in the house! It keeps beautifully for up to several days. Many of us have suffered that sinking feeling that happens when you go to remove a cake from a pan, only to find that the bottom has stuck. I learned this trick for foolproof cake pan preparing from a bakery I once worked at: Use a pastry brush dipped in room temperature butter softened to the consistency of mayonnaise to brush the pan with a thorough coating of butter. The soft butter will cling to the interior of the pan (unlike melted butter, which will run down the sides of so-called nonstick pans and won’t do any good). Once your pan is thoroughly coated in soft butter down to the last nook and cranny, dust the pan all over with flour, upending the pan over the sink and gently tapping it to oust excess flour. 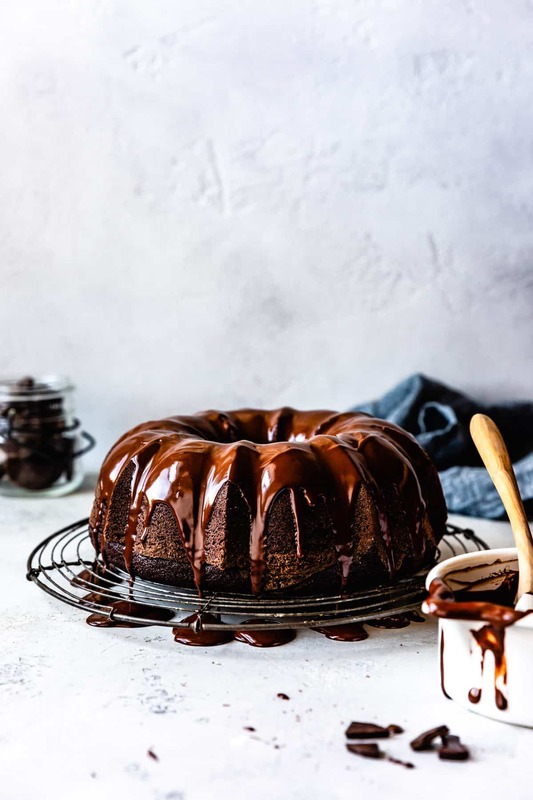 If you take the few extra minutes to prepare your bundt pan correctly, your cake will release cleanly and easily from the pan every time, and you’ll never suffer a sticky bundt cake again. 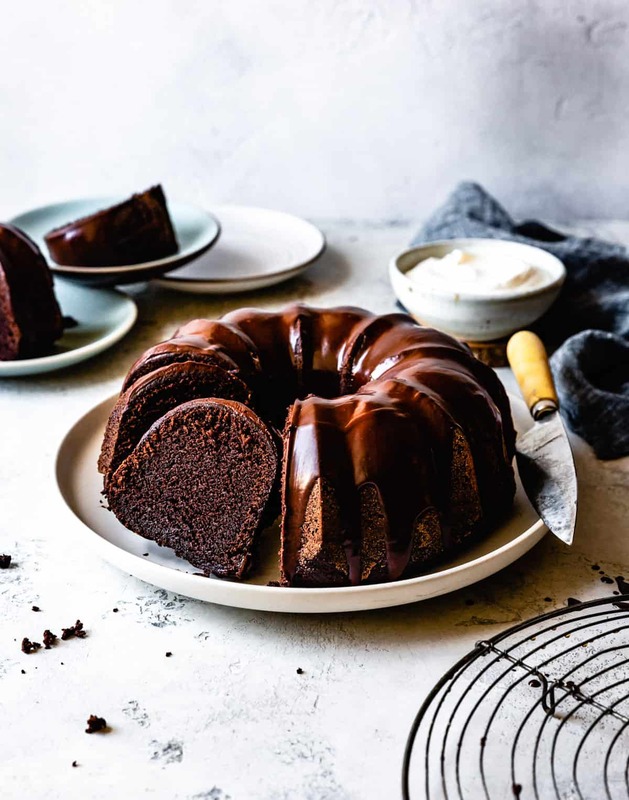 This gluten free chocolate bundt cake gets its fudgy interior and fine crumb from nutrient-rich teff flour plus loads of butter and crème fraîche, all crowned with dark chocolate ganache. Position a rack in the center of the oven and preheat to 350ºF. 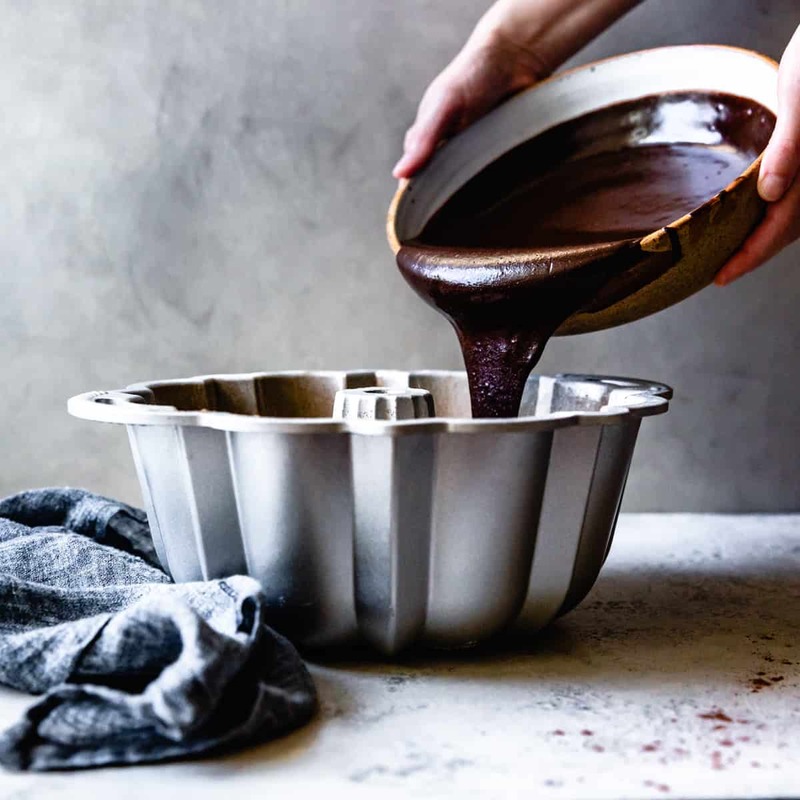 Use a pastry brush to very thoroughly butter the inside of a 9 or 10-inch (10 or 12-cup) bundt pan, being sure to get into all the little nooks and crannies. The butter should be at room temperature and the consistency of mayonnaise so that it clings to the pan, not melted which will run down the sides of non-stick pans and not do any good. When the pan is thoroughly coated, dust the pan with a few tablespoons of teff flour, tapping it around the the interior to cover every surface. Turn the pan over in the sink and gently tap the pan to remove any excess flour. In a large mixing bowl, sift together the teff, sweet rice, and tapioca flours with the cocoa powder, baking powder, baking soda, and salt. Add the brown sugar, crème fraiche, melted butter, vanilla, and hot water to the batter. Add the eggs and quickly whisk the batter until smooth and no lumps remain. Pour the batter into the prepared pan and bake until the top springs back to the touch and a toothpick comes out with moist crumbs, 45-55 minutes. Remove from the oven and let cool at least 10 minutes. Invert a wire rack over the bundt pan, grasp both with oven mitted hands, and flip the whole thing over. Remove the bundt pan and let the cake cool completely on the wire rack, about 1 hour. In a small saucepan, bring the cream to a bare simmer over medium heat. Remove the pan from the heat and add the chocolate. Let sit until melted, about a minute, then gently whisk until smooth. Whisk in the crème fraîche, whiskey, vanilla and salt. The ganache should be thick but pourable; if it’s too thin, let sit at room temperature to thicken up a bit. If it’s too thick, warm over a low flame for a few seconds, stirring constantly. Pour the ganache over the cake. Let set at room temperature until firm enough to slice, 20 minutes or so. In the bowl of a stand mixer fitted with the whip attachment (or in a large bowl with a balloon whisk or electric beater), combine the cream, crème fraiche, sugar, and vanilla. Whip on high speed until soft peaks form. Serve slices of cake with big dollops of whipped crème fraiche. Store leftover cake at room temperature for up to 1 day or refrigerate airtight for up to 4 days. Bring to room temperature before enjoying. Wow!! I cannot wait to make this over the holidays with my family! Thank you SOOO much for having all of these amazing gluten-free recipes. Quick question: how cool does the cake need to be before pouring on the ganache? I know if it is too hot the ganache will run off. Should the cake be room temp to the touch? Aw, thanks for the sweet words! Room temp to the touch should be perfect, but if it’s a little warmer, that’s ok too. Please let me know if you give it a go! This is just SPECTACULAR. I have never tried baking with teff, but looking at this gorgeous cake, I want to run to the store and get some. Plus, how can I say no to goodness of creme fraiche. As always, this is just so stunning my friend. PS: Thanks for the link. Sending you the warmest hugs. How can I replace teff and cream fraiche ? Because they both are not easy to source. Actually I have a creme fraiche recipe in my book – it’s easy to make! I really love the teff flour here, but you could try swapping it for other GF flours that you like the taste of (buckwheat, oat, sorghum, or a blend). I know you’re good at experimenting – let me know what you try! I made this cake yesterday to bring to a New Years party. The cake turned out rich and delicious but slightly too salty. After searching three stores for creme fraiche I gave up and subbed sour cream which may have created this result. The ganache however was a bit of a head scratcher. Once the sour cream was added it took the beautifully pourable chocolate down to a bit of a more chunky separated texture that resembles when sugar starts to seize up. 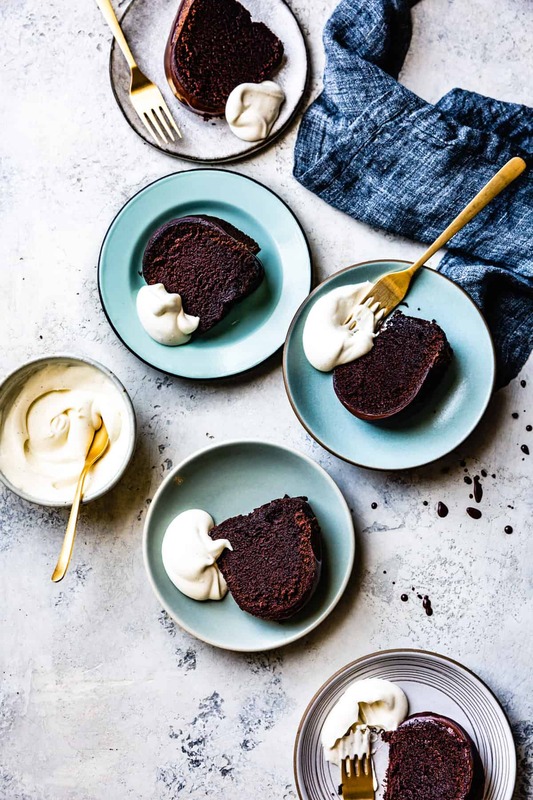 Overall this is a quality recipe that I would try again to see if the creme fraiche makes a difference in the saltiness and would sub in a different ganache. This looks like a mighty fine cake, gluten-free or otherwise and I’m obsessed with that knife.